No child should ever go to bed hungry. It breaks my heart knowing that there are so many kids out there with nothing to eat. No child deserves that. 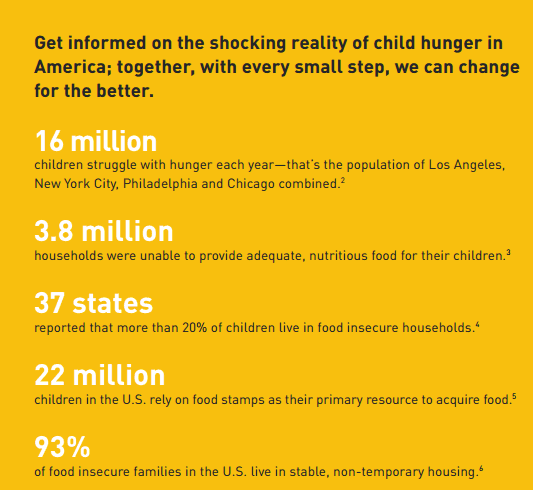 In the USA, 16 million children are struggling with hunger right now. 16 million. Wow. To put that number into perspective a little, look at the population of Canada. 35 million people live in Canada so that is just a little less than half the country. 16 million is also the population of Los Angeles, New York City, Philadelphia and Chicago combined. I had no idea it was that prevalent and widespread. Hunger knows no boundaries. It affects children everywhere – in rural areas, urban centres and suburbia. 1 in 5 kids don’t know where their next meal is coming from. In all likelihood, you know a child affected by hunger. It could be your neighbour, someone in your child’s class or maybe even someone in your own extended family. Hunger is a reality for many kids. It shouldn’t be this way. It isn’t right. For me personally, I worry about money a lot. I’m a mom of two daughters and also the only person currently employed in my home. We have food to eat right now, but I sometimes wonder what will happen if there is no work. How would I pay my bills and feed my family? I’m fortunate right now to not have those concerns, but you never know what the road is like ahead. Unilever Project Sunlight is working to raise awareness about child hunger and to inspire people across the USA to help out in their communities. If you haven’t heard of Unilever Project Sunlight before, let me give you a brief rundown of what they are all about. They are an initiative that encourages people to work together to create a brighter future for children. They believe that even small acts can make big changes. This fall that initiative is child hunger and they are encouraging everyone to get involved and most importantly to share a meal. On October 13th, Unilever Project Sunlight premiered an original documentary titled, Going to Bed Hungry: The Changing Face of Child Hunger. It shares the story of real families that battle with the reality of hunger. It’s a powerful, moving video and also very eye-opening. The people in the video are like you and me. They just want what is best for the children. Check it out below and see what I mean. I was especially moved by the woman who lost her husband in a blink of an eye. It reminded me how life circumstances can change for any of us at any moment. We can quickly go from the ones providing help to others to the ones who need the help. So what can you do to help? There are a variety of ways to get involved and offer your support to “Share a Meal” initiative. Download the Unilever Share Meal Toolkit to get more details on the power of a shared meal and how you can help. Here are several ways to get involved in your local community. 1. Help a family in your neighbourhood. Share a meal with a neighbour whether it’s a simple lunch or an elaborate dinner party. Another idea is to pack an extra lunch with your child to take to school to help out a child there. 2. Partner with local organizations. Contact a local community organization and tell them about the Share a Meal initiative. With their networks and resources you can reach out to many more people than you could alone. 3. Coordinate with your local food bank. Contact them to volunteer or host your own local food drive. Use Feeding America’s online Food Bank Locator to find the one closest to you. 4. Host a Virtual Food Drive. Try Feeding America’s Personal Fundraiser tool to reach out to friends, family and coworkers for contributions. 5. Donate. Make a donation to Feeding America. A great idea is swapping a night out for a night in and donating the money you would have spent. 6. You Buy One, We Give One. Make sure you look for the Unilever “You Buy One, We Give One” coupon offer in the Sunday paper on November 16th. Redeem the coupon at participating stores from November 16 to 30th and Unilever will donate one meal to Feeding America when you purchase any participating Unilever product. That’s a win-win! You save money and help out a good cause. I encourage you to learn more about Project Sunlight and get involved in any way you can. Also please share this important program with your friends and family. There is strength in numbers and together we can all make a difference. Why is #ShareAMeal important to you? 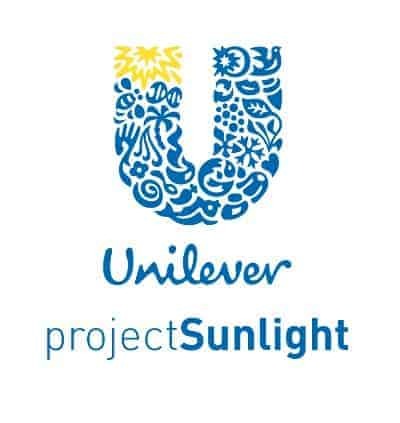 Connect with Unilever Project Sunlight on Twitter, Facebook, Instagram and Pinterest. I think it is terrible for a nation like the USA to have such an appalling record. Children should never have to suffer like this. Definitely an important issue we could all do more for. We just signed up this weekend for monthly donations to our local food bank. Being on the road we don’t get the opportunity to volunteer as much as we would like so took this step instead. Amazing program and it brings to light a very important issue of hunger in America. I work at our local food pantry and I am amazed at the amount of people that need helpl. Hunger is often a hidden issue in our world and it is always good to see companies stepping up to help out. We try to donate to our local food bank whenever we can. It breaks my heart too and the numbers are staggering. Hunger doesn’t have an age or location restriction. It doesn’t stop after a few days or for winter. It goes year round and could be anyone. It’s important to be aware and try to help when you can. What a wonderful program. It is so sad that so many go hungry especially children. We donate to the food bank and my son volunteers there. We also donate to breakfast club at local schools. I live in Oregon and there is a lot of kids who need this. I don’t understand why this happens too. There is a lot of people on food stamps and I don’t think they use them wisely. No child should have to be hungry not in the US. There should always be a place to go for our children for sure.